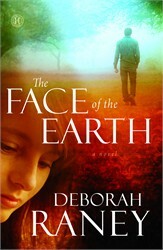 Today XOXO After Dark is pleased to welcome bestselling inspirational author Deborah Raney, author of dozens of novels, including her most recent, THE FACE OF THE EARTH, now available from Howard Books. We know fans of historical fiction come from many places, so we thought it would be fun to hear from an author who loves reading it–but doesn’t want to write it! Heather Bradford grabbed her handbag from the credenza in the parlor and stepped out onto the back deck, panning the horizon. My fingers paused on the keyboard. Was a purse actually called a “handbag” back then? Better check. Okay, Webster said the word “handbag” only came into popular use around 1862. My Heather lived in a remote area and was not especially fashion conscious. Not likely she’d have adopted such a newfangled term. Two hours of research later, I settled on “reticule” and hoped my editor would correct me if I was wrong. Heather Bradford grabbed her reticule from the sideboard in the parlor and stepped out onto the back deck, panning the horizon. Hmmm…come to think of it, I doubt it was typical to build a deck onto homes back then. Or at least if they did, they’d call it something else, right? A porch maybe? Or veranda? Portico? Terrace? I highlighted the phrase “onto the back deck.” My brother is an architect. He probably took some architectural history classes on his way to getting licensed. I could give him a call later. I read my sentence again. Something still seemed “off.” The word “panning” stood out somehow. I looked it up: pan [verb] – to rotate (as a motion-picture camera) so as to keep an object in the picture or secure a panoramic effect. 1930. Shoot! (No pun intended.) It was a movie term. I couldn’t use a movie term in a novel set in 1864! Delete delete delete. I was starting to hate this Webster guy. Heather Bradford grabbed her reticule from the sideboard in the parlor and stepped out onto the porch[? ], scanning the horizon. Wait! Was “scanning” a printing term? You know: PSC. Printer/Scanner/Copier? Consult Webster. Nope, I was okay there. “Scan” was also a legitimate and ancient verb. But my heroine’s name didn’t ring true. Sure it was one of the most common and popular names at the time I was writing that novella, but further research revealed “Heather” was almost nonexistent as a woman’s name before 1940. Okay, fine. I could change her name. My great-grandmother was born around 1880. It would probably be safe to use her name, Stella. Delete delete delete delete. Stella Bradford grabbed her reticule from the sideboard in the parlor and stepped out onto the porch[? ], scanning the horizon. Three days and 578,642 dead brain cells later, I finally had an opening line for my novella, but by now I was second-guessing myself on every single word. Was the word “grabbed” in use back in 1864? Probably, but had the term made its way to the Dakota Territory by then? Was there even a horizon back in 1864? Sheesh! I finally, finally finished A Circle of Blessings and it appeared in the lovely Christmas anthology, A Currier & Ives Christmas. A few years later I was invited to contribute to A Prairie Christmas Collection, a beautiful new anthology of historical novellas. And yes, my name is on the cover. But don’t let that fool you. My offering to that collection is, once again, A Circle of Blessings, the first, last––and only––historical piece Deborah Raney ever wrote. And now you know why I have such deep respect for the authors of the historical novels I love to read. My hat (or should that be chapeau?) is off to every one of them! And although the details and culture of women’s lives change as the decades fly by, our emotions and relationships have much in common with our grandmothers and great-grandmothers. We still learn who we are through our relationships with parents, children, siblings, and BFFs. Like women of bygone eras, we still struggle to find where we fit in, who we were created to be. We still cherish the things that make us laugh and cause us to hope. And we still fall in love and dream of a love that will last a lifetime. DEBORAH RANEY’s first novel, A Vow to Cherish, inspired the World Wide Pictures film of the same title and launched her writing career after 20 happy years as a stay-at-home mom. Since then, her books have won numerous awards including the RITA Award, National Readers Choice Award, HOLT Medallion, the Carol Award, and have twice been Christy Award finalists. 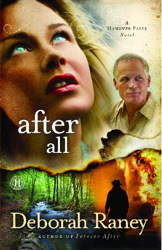 Deb’s 23rd novel released from Howard/Simon & Schuster in May 2013 and she is currently working on a new five-book series for Abingdon Press Fiction. Deb enjoys teaching at writers’ conferences across the country. She and her husband, Ken Raney, recently traded small-town life in Kansas ––the setting of many of Deb’s novels––for life in the (relatively) big city of Wichita where they enjoy gardening, antiquing, movies and traveling to visit four children and a growing brood of grandchildren who all live much too far away. Visit Deb on the Web at www.deborahraney.com. When Mitchell Brannon’s beloved wife sets off for home after a conference, he has no idea that his life is about to change forever. Mitch returns from work early that evening, surprised that Jill’s car isn’t in the garage. Hours later, Jill still hasn’t returned, and Mitch’s irritation turns to dread. When the police come up empty, Mitch enlists the help of their next-door neighbor, Jill’s best friend, Shelley, to help search. As hours turn into days and days into weeks, Mitch and Shelley’s friendship grows ever closer—and decidedly more complicated. Unearthing a lost memory may cause her to lose everything Bryn holds dear… but could it also set her free? 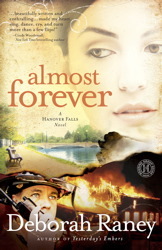 A Hanover Falls novel. 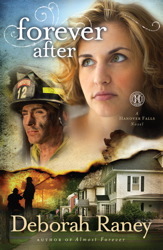 Eighteen months after the tragic Grove Street Fire took the life of her husband, David, and four other heroic firefighters, Susan Marlowe thinks she's finally beginning to heal. But then she discovers that David carried a secret to his grave. For the sake of their sons, can Susan forgive the unforgivable?